A perfect way to bring elegance to any room, entrance or hallway; plaster niches can be placed to provide a real focal point. 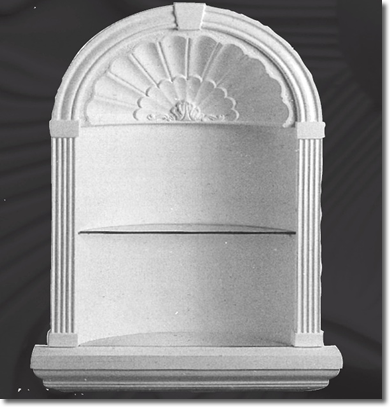 Used to enhance areas and showcase belongings, or even just to display flowers, niches are truly luxurious and can enhance any area. Our team can help you design bespoke niches, or will help you choose from our ready made mould templates. We can incorporate glass shelving, and bottoms, if you wish. And we are able to accommodate lighting should you wish to add subtle lighting to behind or beneath the niche. Our technical team are on hand to offer advice on the size and type of niche that you will select. We invite you to challenge us to design one that perfectly compliments the rest of the area in which you will place your niche. Speak to use today to take advantage of our personal service from an expert team. We are ready to help you choose a plaster niche that is most suitable to your application.